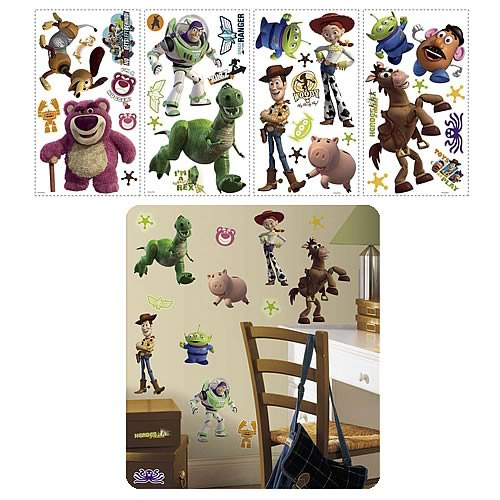 Let Woody, Buzz, and all your favorite toys keep an eye on your room! Includes over 30 decals; some even glow in the dark! Easy to apply…just peel and stick! Let Woody, Buzz Lightyear, Jessie and all your favorite toys keep an eye on your room with these Toy Story 3 Peel and Stick Wall Appliques! Includes 22 decals, ranging in size from 1 1/4-inches tall to 12-inches tall. Some decals even glow in the dark after being exposed to light! Features all your favorite friends from Disney/Pixar's Toy Story 3. Woody, Buzz Lightyear, Bullseye, Hamm, Jessie, Rex and so many more! Move them around and re-use them again and again! Order yours today!